One good reason to travel to Cuba, if you’re an old car buff. What could be better than taking a ride in an 1950s American car? Should I travel to Cuba? Should I take a Cuba vacation? Ok then, this is why you should travel to Cuba now. First, Cuba is a living country, not a gaudy painting of an antique car on somebody’s basement wall. And, like any other place that foreigners visit, tourism has already changed it. So, while there are still plenty of old American cars, Cuba has already changed. The Canadians, Chinese, and Europeans, who aren’t hindered by the Trump administration’s travel restrictions, have already seen to that. But that’s not the reason you should travel to Cuba anyway–to see a country that somehow is a museum of nostalgia for the 1950s–ideas that are the antithesis of those of the post-World War II era when America dropped all pretense of isolationism and spread its business over the world. The San Juan Hill memorial in Santiago. 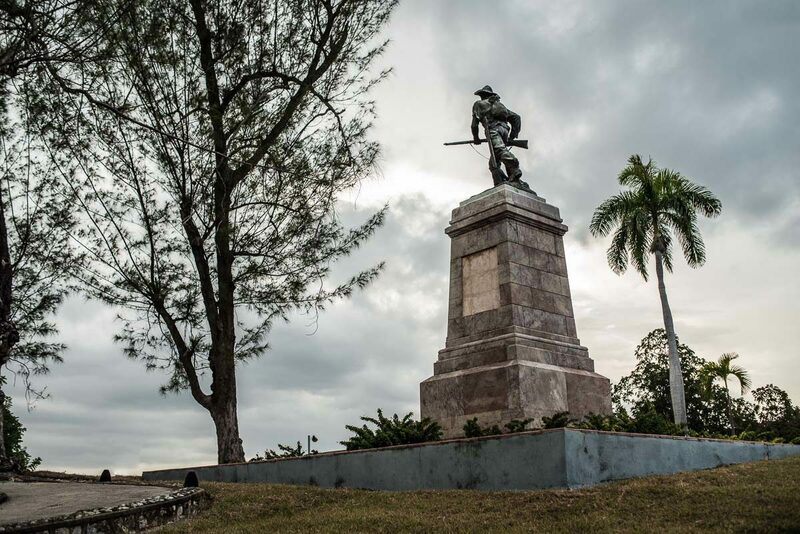 A gracious memorial to the US soldiers, but also a reminder that the US just took over the colony from Spain. In fact, since the United States pretty much took over Cuba after the Spanish American War, (after taking over the ongoing revolts of the Cuban people against Spain,) the Cuban revolution of Fidel Castro and Che Guevara was not directed against American puppet Batista so much as it was against the U.S. itself, as exemplified by ATT, United Fruit, and Meyer Lansky. But I’m not here to write a history lesson of the U.S.’s misdeeds in Latin America, because that would take a book or ten. But it’s helpful to know just a little about Cuba’s history to begin to understand what you’ll see if you travel to Cuba today. The Castro revolution is not some event that happened nearly 60 years ago. It exists today and forever, in spite of–or maybe just alongside of–the modern surge that tourism and the internet have brought to the island. Cuba, more than any place I’ve visited, is a mass of contradictions, maybe best summed up as the conflict between the dreary oppressive order imposed by the government and the colorful Caribbean chaos familiar to anyone who has been to that part of the world. If, like me, you embrace ambiguity, that’s reason enough to tour Cuba. Consider the city of Havana in particular as a metaphor for the idea. 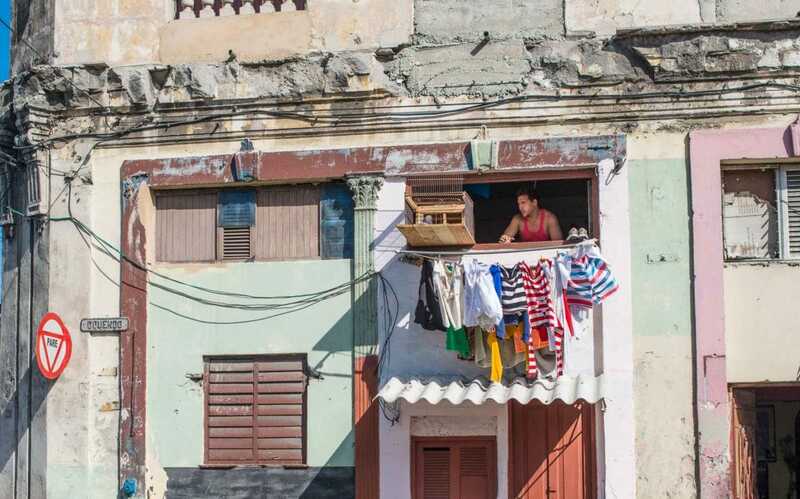 When you first see Havana outside the Old City, what strikes you is the pervasive decay. Buildings that have received no maintenance since 1959 form a fragile honeycomb of blight. Jungle trees and tropical vines grow up through broken windows. Decades-old scaffolding holds up fronts of buildings whose original supporting structures caved in long ago. Once elegant art nouveau façade figures thrust, noseless, above cracked and crumbling columns. But, on the ground floors, those buildings that are still habitable sport bright island turquoise, yellow, and red painted walls that belie the manifest malaise that surround them. The colors seem noble and futile at the same time. More incongruous than the optimistic rainbows, perhaps, are the ubiquitous signs celebrating Fidel and Che. At night, Havana’s contrast with a modern city is reinforced by the dark. Other than a few main streets lit mostly by traffic lights, the neighborhoods are dim. Even in the touristy areas of Old Havana, frugally lit commercial streets run parallel to streets with no illumination save that which spills out from ground floor living quarters onto the crumbling sidewalks. If you want to find your way, listen for music coming from a bar and head for that street, and work your way around from there. The hum of commerce that you see in any other world capital–well-dressed business people moving purposefully between office buildings and busy cafes–is entirely absent in Havana. It’s almost as if there is no business here other than tiny enterprises that cater to tourists such as rooms for rent for family visits for tourists and restaurants that seat maybe twelve people. In general, the city is uncomfortable and inconvenient. It’s hard even to find a small store to buy something to eat or a bottle of water. For a tourist, sometimes it is absolutely difficult to spend money. The shops you do see are often the government bakeries or groceries where people line up, ration books in hand, to buy their daily bread for the equivalent of three cents or their weekly ration of meat–more frequent if there are growing children who need protein. Another beautifully preserved Chevy. Most of them are taxis for tourists. Cruising in front of the decrepit buildings, of course, are the 1950s American cars. 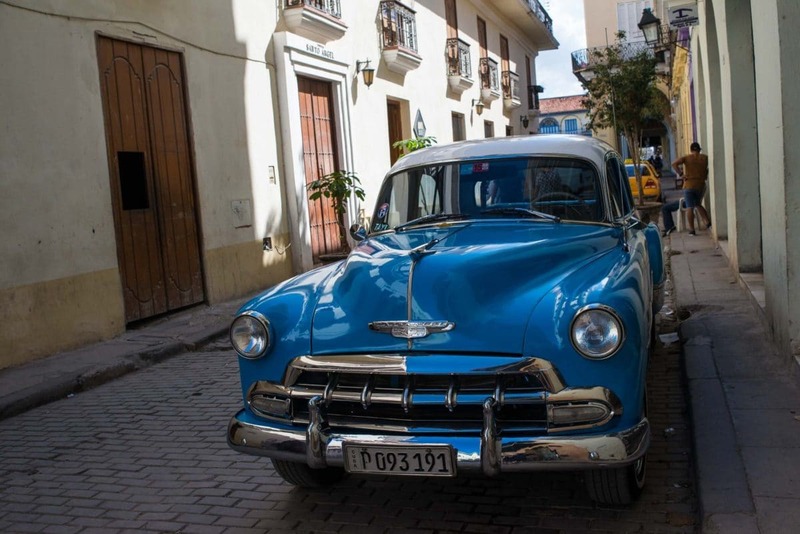 Unlike the buildings, which are owned by the government, these 60-year-old cars are not just evidence of the American blockade of Cuba. They, because they’re one of the few things Cubans can own, are the obvious symbols of a Cuban’s ability to cope, and, even more, of his ability to scrounge. When you ask an owner about his car, you’ll find that about the only thing authentic about that 57 Chevy you just rode in is the body, and maybe the steering wheel. The rest of it, from the upholstery to the engine and drive train, has long since been replaced. That roar you hear is not a General Motors V-8. It’s probably a Russian manufactured diesel. The cars’ shiny exterior and functional undercarriage is yet another metaphor for the life of the Cuban. But, lest you think the island is in a steady state of dreary existentialism with occasional bits of color painted on for the visitors, there is also plenty of evidence of a tropical buoyancy that hasn’t been sunk by the weight of economics or politics. Joyous music flows out of nearly every club or restaurant. Most of all, there is music pretty much everywhere. And yes, much of it is played for the tourists, but the quality usually ranges from the merely good to the sometimes sublime. An amazing saxophone player fronts a so-so band in a Havana cafe. A six-piece female band serenades rooftop drinkers in Santiago. (The band was a lot better than the mojitos.) And a singer from the Cuban national opera treated us to Carmen (what else?) in front of the Holguin library. In Cienfuegos, you can hear a world class a capella singing group that used to tour the world, until several of their members defected a few years ago in Coeur d’Alene, Idaho. An iPad is a rare toy, so you must share with the other kids. There are teenagers playing stickball with a piece of aluminum electrical conduit and a plastic bottle cap, and other young men just sitting and grooving to the Spanish hip hop blasting from an open doorway. 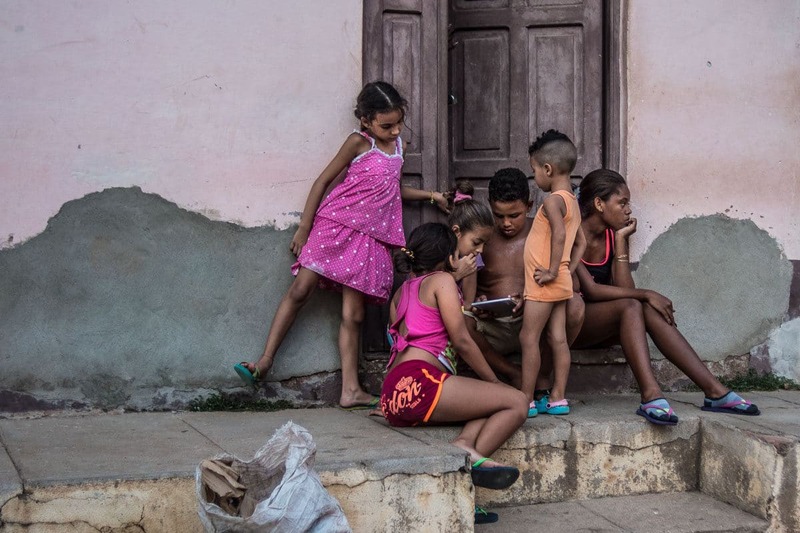 In Trinidad, six kids surrounded one iPad, and dozens of young people sat on a Havana curb feasting on the rare Wi-Fi signal. 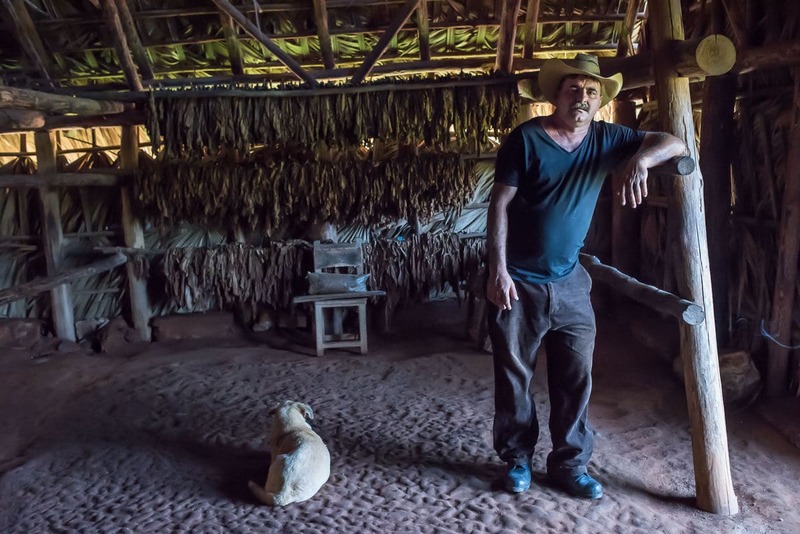 A tobacco farmer and his dog in the drying barn. 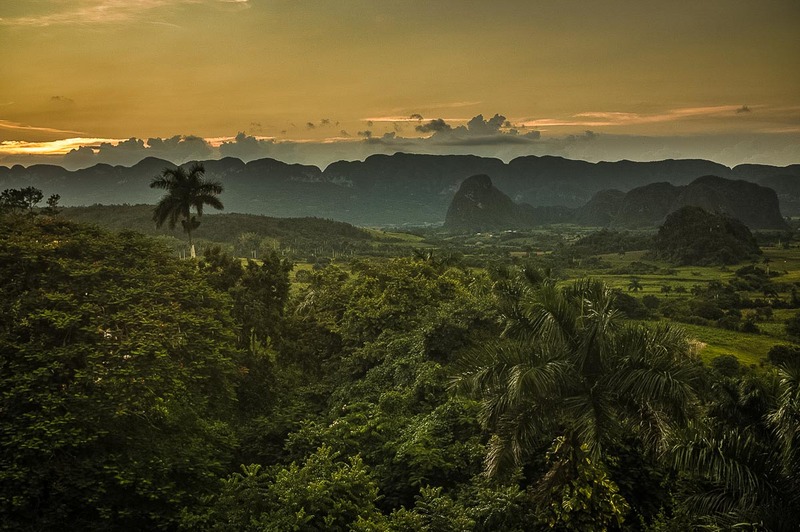 The Viñales Valley at sunset. An unexpected benefit of the lack of economic vigor in Cuba is the inadvertent preservation of much of its natural beauty. Although much of the native vegetation was leveled to create sugar plantations, the generally mountainous terrain, coupled with a jungle’s relentless resistance to control, leaves some spectacular landscapes to explore. (To be fair, it should also be noted that Fidel set aside lots of national parks and wildlife preserves.) Particularly in the western Viñales Valley, the smaller nature of Cuban agriculture and the stubborn insistence on the “old ways” of non-mechanical cultivation–particularly of tobacco–leaves the vistas mostly unspoiled. The Zapata Peninsula wildlife sanctuary near the famous Bay of Pigs, accessed only by one bumpy dirt road, showcases both spectacular flocks of water birds and crabs that scuttle by the hundreds sideways across the road ahead of your four wheeler. There are many botanical preserves of both natural and cultural significance. An old sanctuary for runaway slaves has become an improvised museum. A flourishing mountainside has been taken over by a sculptor who has seeded his fantasy figures throughout orchid strewn slopes. And a comprehensive botanical garden, once owned by Harvard University, was taken over after the Castro revolution and flourishes still. 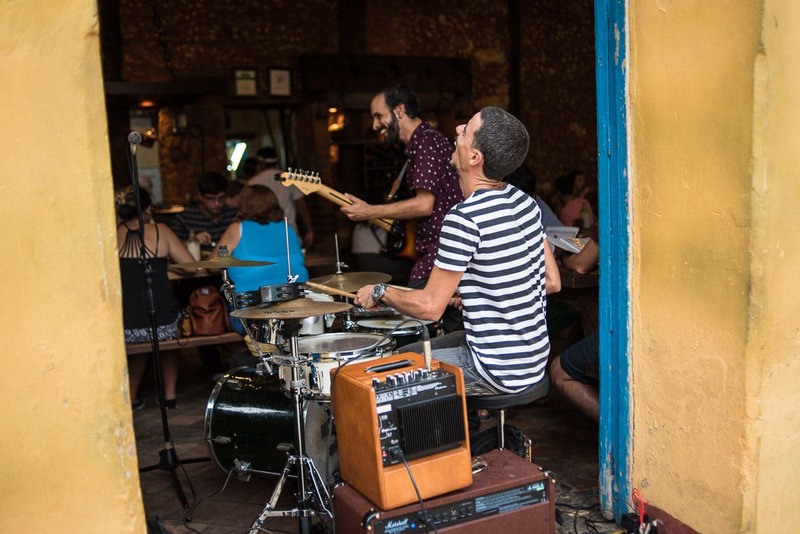 In some places, such as the riot of art of the Fusterlandia neighborhood in Havana, the activities of private foundations, or at least private artists, are apparent. And, who knew there are extensive hiking trails and national parks all over the island? Some of them lead to obscure pools at the bottom of waterfalls and others end at large open air restaurants which grow their own produce in a huge organic garden. Meici came into our Havana apartment and cooked our breakfast every morning and stayed for a chat. She invited us to her home to meet her mother. 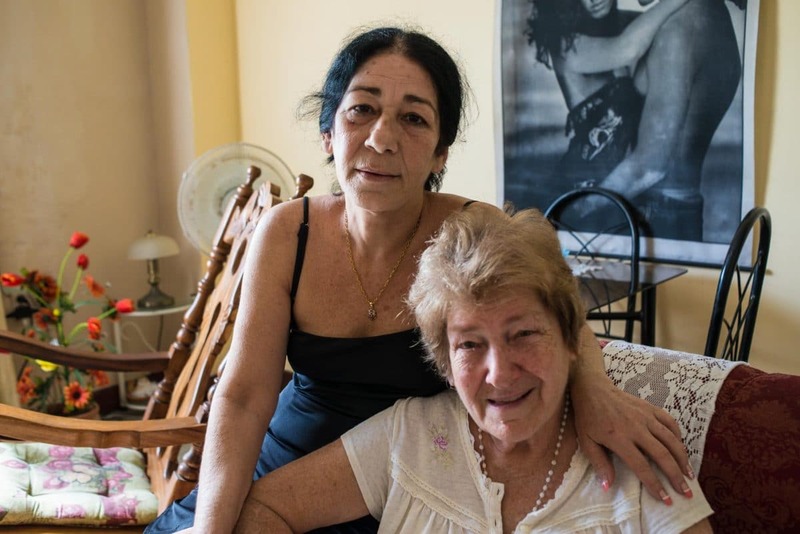 The best way to meet people in Cuba is to stay in their homes. Because of the relative newness of tourism and the prohibition of most foreign investment, there’s a shortage of hotels in Cuba. In the recent years, Cubans have been allowed to run a bed and breakfast out of a spare room or two. They’ve been permitted to remodel rooms for that purpose. And, when they can get their hands on scarce building materials, they do. Of course, especially in Havana, charming rooms in former wealthy mansions are available. If you’re lucky in August there will be a noisy ceiling fan to move the air around. Of course, the tropical heat doesn’t surrender willingly to a slow rotating fan. In that case even an ancient noisy air conditioner can be tolerated. You’ll be glad you brought ear plugs to deaden the death rattle of the old compressor and the traffic outside. These family visits are also the best way to eat fresh food, because people who are allowed to house visitors are also allowed to buy fresh fruit and eggs that are unavailable to most Cubans for their guests. It takes a bit of joy out of a fresh mango to know that your host will be eating a white bread and margarine sandwich in the kitchen. Try to leave some fruit on your plate in the hopes that the cook will get your leftovers. Meeting the host–or maybe the person who comes in to cook your breakfast for an additional $5 for both of you–is also the best way to get a primer on Cuban politics. I learned how the room rent system works and the assiduous record keeping necessary to account for the mangoes and eggs and rental income to the frequent government inspectors. I also learned that before discussing such things as government inspectors, a Cuban citizen will make sure all windows and doors where anyone might overhear are closed tight. Even then, revelations come only in whispers. But revealing they are, and speak to the difficulty of making a living in Cuba. Everyone has something going on the side. When we think of Cuba as outsiders, we realize there’s an uneasy pact between the people and the government. The government provides essentially free housing, cheap staples, and free education and health care and jobs. In return, the government expects appreciation and loyalty. It’s a perverted system that is some sort of odd hybrid of all the best and worst facets of socialism. Work in Cuba is, for many, a hustle. Official government jobs pay around $30 per month, and even with $15 rent and three-cent bread, that’s not enough. So, you have a taxi driver who is a mechanical engineer, a tour guide who is a doctor, and a the guy mixing your mojito is a history professor. All make more in tips in a night than a month’s salary in the jobs they were trained for. To be generous, the Cuban dictatorship can be seen as an understandable over reaction to the arc of Cuba’s history from Christopher Columbus to General Leonard Wood to the Mafia. There’s a persistent prohibition against any outside investment. And that suppresses economic activity that could make jobs for their supremely educated citizens. And there, too, the American economic blockade of Cuba both hurts U.S. interests and plays right into the hands of the Cuban government who can conveniently blame the U.S., perhaps justifiably, for much of the country’s problems. Clearly, too, there are a lot of U.S. politicians such as Ted Cruz and Marco Rubio who also love having Cuba as a piñata to pound and watch the votes spill from its ruptured guts. You should not assume that all, or even most, Cubans see the world through American eyes. While there is a large pall of dissatisfaction, there is still a genuine reverence for the heroes and ideas of the Castro and Guevara revolution. 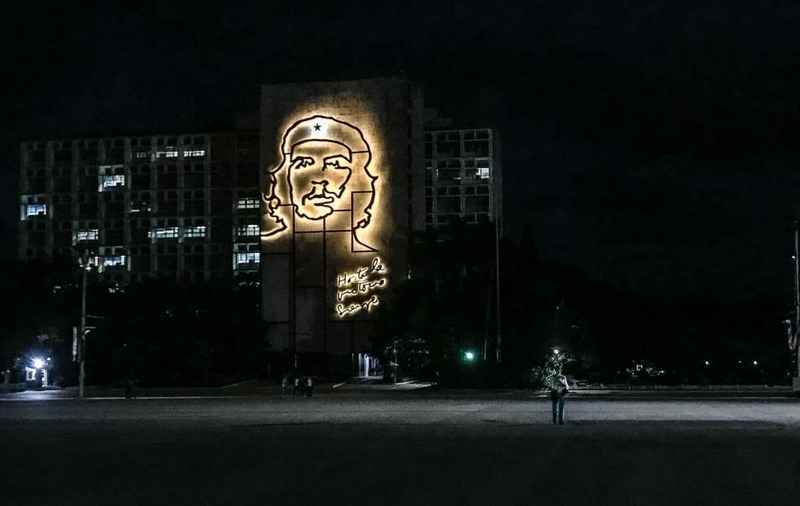 The ill-conceived emptiness of the Revolution Plaza in Havana features enormous neon caricatures of Che and fellow Revolutionary leader Camilo Cienfuegos. I went there twice and never saw more than a few people walking aimlessly across the vast expanse as the base of the surpassingly ugly monument tower. In contrast, I also visited the cemetery in Santiago where Fidel is buried. 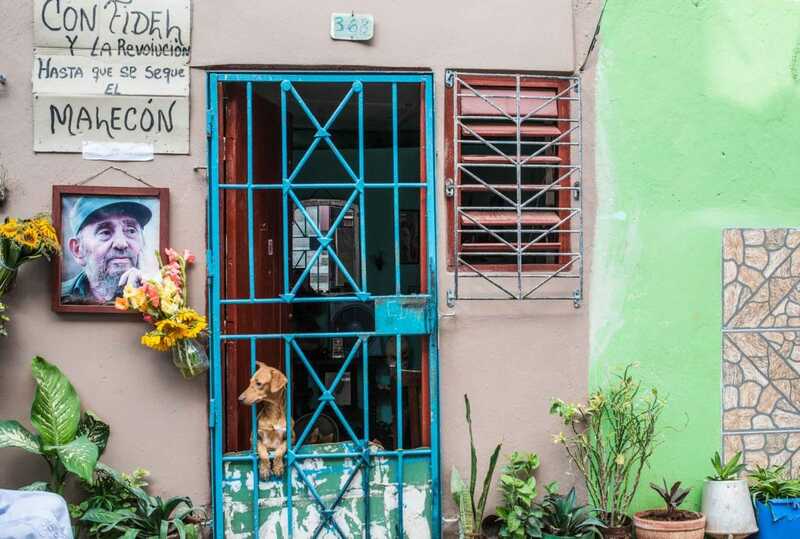 There, a hundred or so people were lined up before the gates opened to lay flowers at Fidel’s simple grave and that of José Martí, the poet who led the first armed revolt against the Spanish in the 19th Century. In fact, Martí’s tomb is much more elaborate than Fidel’s, which honestly, I think speaks well of Fidel. Cuba is a land of contradictions. It’s impossible to make an elevator pitch of why you should travel to Cuba. It’s beautiful and ugly, sad and cheerful, ebullient and pensive, liberating and oppressed. And it must be seen. If nothing else, it will make you think more deeply about most everything else you’ve ever seen. That’s the best reason for travel to Cuba. 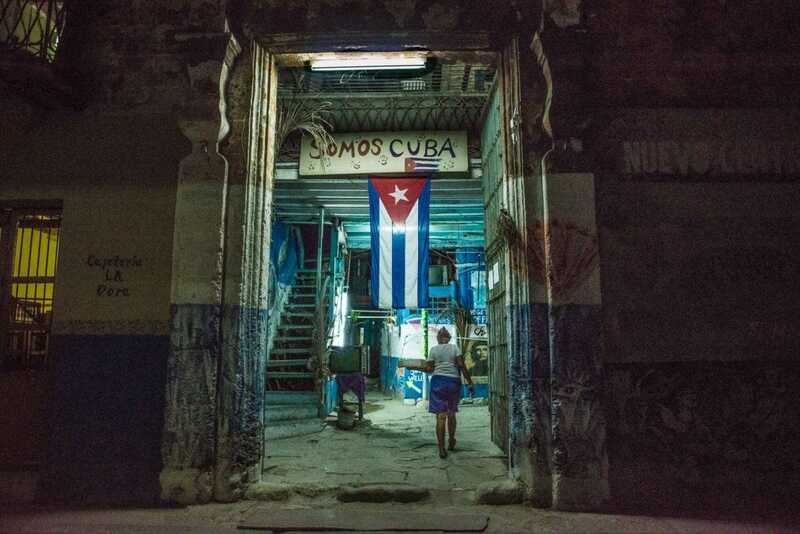 The dark Havana streets and a barely lit restaurant called Somos Cuba–We are Cuba. Here are a few more of our posts with information about Cuba. Update: On April 18, 2019 the Trump administration banned almost all travel to Cuba for Americans. We recommend calling your member of Congress. You are definitely right about visiting Cuba. My husband and I returned in mid December 2017 from a 12 day visit of the island. We visited Havana, Cienfuegos, Trinidad and Santiago with many small towns and villages along the way. It was certainly a visit of contrasts as you stated and well worth the opportunity to see the country before tourism dramatically changes its people. I was intrigued so much by Havana, but I loved Santiago. There are lots of differences between the two, All in all, the eastern part of the island is fascinating in a completely different sense. Our digital nomad son who has made Mexico City his home base visited Cuba with a Cuban friend who works as a waiter in Mexico City, He stayed with the guy’s family out in the countryside and his experience mirrors yours, only perhaps more so. He was invited to a disturbing ceremony out in the jungle that involved animal sacrifice—disturbing to him anyway. My understanding is that Americans really aren’t re-barred from visiting Cuba, but they are not supposed to patronize any business owned by the Cuban military as apparently quite a few tourist hotels are. Do I have that right? If you have an “Ad” for your tour, I’d be happy to share it with my FB friends—on my “personal” page. Having at least shared a few meals with you and Kris (Philly, Toronto, Llloret del Mar), I can vouch for your Spanish and your travel smarts. Thanks, Suzanne. Americans aren’t really banned, but my understanding is that you have to go with a licensed American tour operator who has a “People to People” permit. There are some other loopholes, I think, in some other categories of visitor. And your son seems to have wandered into a real Santeria ceremony, instead of the stuff they put on for tourists in Callejon de Hamel in Havana. I’ve known one or two people who’ve been to Cuba in the past and spoken highly of it. But I do worry that it will change as more people start to visit – you’re right to say that people need to go soon. I don’t think there’s a huge rush, but all things change. In Cuba, I think things will improve as more visitors come. The isolation imposed by the US needs to end. If the US Government were really interested in spreading democratic ideas, the more openness the better. Loved everything about this — the fantastic photos, travel tips, and the historical and political perspectives. After reading this article, I can’t think of a better guide than you for a Cuba visit. Wish I could sign up — maybe the next one! Actually, you sold me with the first pic. I’ve always loved the photos of old cars in Havana. It would be so cool to have a taxi ride in one. Gee thanks, Cathy. I’d love to go with someone like you. Next year? 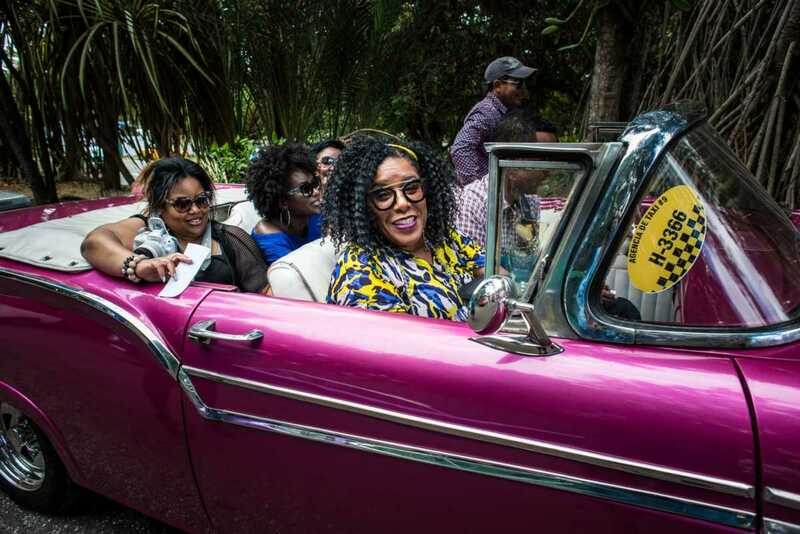 Great post, love the photos – a visit to Cuba is definitely on my list, if for no other reason than to ride in a cool car. Need someone to carry your backpack? I make a good Sherpa. Rose, it’s a special trip. Unlike anywhere we’ve been. And, so close to the US. And so far. You guys have a great blog. I just found it & am really enjoying going through all your posts. I look forward to visiting Cuba one day! Thanks for inspiring me. Thanks very much, Kelly. I hope you do get to Cuba soon. It’s a very interesting visit. What a great post, interesting and informative detail and your photographs are great – I enjoyed reading this! Well, thanks, Cherrylynn. Make time to visit Cuba soon. You’d love it. I really enjoyed reading your article about Cuba. It has always been an enigma to me and as you mention so full of contradictions that makes it unique in many ways. I think private homes are really an interesting option, not only because of the possibility of fresh food as you mention, but also because of the possibility of sharing with Cubans in their day to day life. I was checking this website: https://www.mycasaparticular.com/es/ and I see many viable offers for those who want to know life among Cubans. Maybe you can find it useful as well. Thanks for your detailed article, it has been very inspiring for me! Olivia, thanks for reading. Yes, I’m aware of mycasaparticular.com and I ended up using it while I was in Cuba. We had a bad experience using AirBnB there, but we also had a good experience with AirBnB as well. In Cuba, everything is a bit of a crapshoot. I think there are some people there who are trying to game the system, and others who are trying a little too hard to make a buck. Luckily, we have friends there now who can steer us to honorable people, and we have some experience there now. I’ll post some direct links to houses we’ve stayed in when I get home and have a minute.